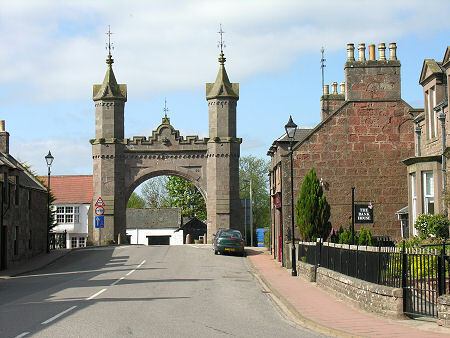 The name of Fettercairn is well known to anyone who listens to Radio Scotland traffic broadcasts in winter. It lies at the southern end of the B974 Cairn o' Mount road, a road that climbs over the eastern extension of the Cairngorms to Banchory. As a result it is regularly the first road in Scotland to close when the snows sweep in from the east. 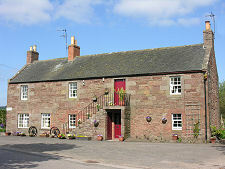 Fettercairn itself is a glorious little village with a population of some 250. Its origins date back over a thousand years, and it was here in 995 that, according to the chronicler John of Fordun, Lady Finella killed King Kenneth II. In 1504 it was made a burgh and permitted to hold weekly markets and an annual fair dedicated to St Mark. 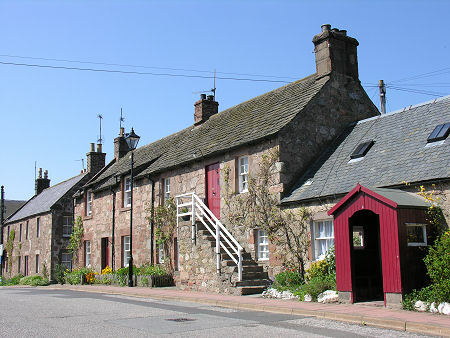 By the mid 1600s Fettercairn was a thriving place, though this came to a sudden - if temporary - halt when the village was sacked and burned by the army of the Marquis of Montrose in 1645. Undaunted, the residents rebuilt, and what emerged over the following centuries was the remarkably attractive village you see today. 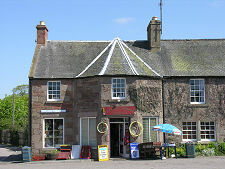 Built largely from a reddish sandstone, over 20 of the village's buildings are listed, including a number of those gathered around The Square, the home of the traditional markets held here. 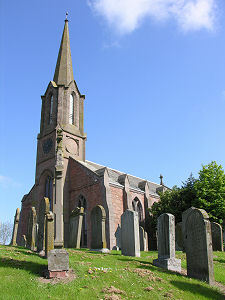 Fettercairn is also home to a fine church, built in 1803 and dedicated to St Martin. The beautifully slender spire is a later addition. 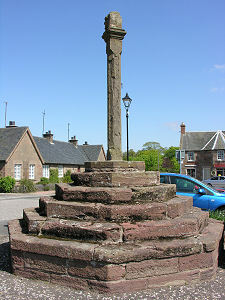 In the centre of The Square stands Fettercairn's mercat (or market) cross. No trace survives of the cross that would have stood in the village from 1504, and the shaft of the current cross is believed to have been moved to Fettercairn from nearby Kincardine when the latter was displaced by Stonehaven as the administrative focus of Kincardineshire. This probably happened in 1670, when a new head bearing that date was added to it. Multifunctional, the cross incorporates a sundial and was also the village stocks: you can still see where an iron collar could be attached. On the west side of the shaft is a groove that is 37.5 inches (or one Ell) in length. This served as a standard length for traders doing business here. 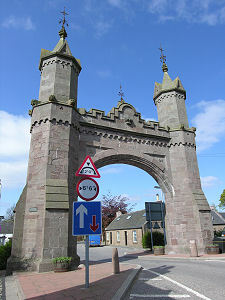 For the visitor, the most obvious structure in Fettercairn is its arch, through which light traffic still squeezes. 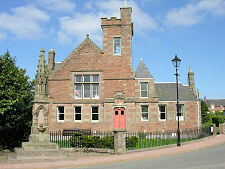 This was erected in 1864, at a cost of £250, to celebrate an overnight stay in the village by Queen Victoria and Prince Albert in September 1861. 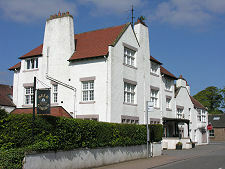 They were on an excursion from Balmoral and had crossed Mount Keen before arriving in Fettercairn. They returned to Balmoral the following day over the Cairn o' Mount road in thick fog. The visit had been intended to be a secret, but by the time of their departure crowds of villagers had gathered to cheer the royal couple. 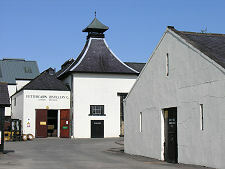 On the north west side of the village, set beautifully against the hills beyond, lies the whitewashed Fettercairn Distillery. This dates back to 1824, though much of what you see today is later. 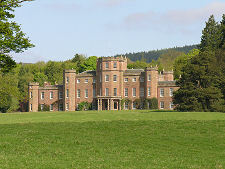 A mile to the north of Fettercairn is Fasque, a superb stately home built in 1809 and from 1829 the family home of the Gladstones, whose most famous son was William Gladstone, one of the Prime Ministers to serve under Queen Victoria. Less remains of the area's original grand residence, Kincardine Castle, first built in stone in the 1200s on the site of a series of earlier wooden castles, all intended to guard the southern end of the strategically important Cairn o' Mount road. The castle, which originally had curtain walls 24ft high, was demolished in 1646, and today there is virtually no sign of it above ground.